Here is another contraption with that ever popular cab ! Emblems removed. Photo from Bill White. I'll go with Foremost as well. Cool,whatever it is. Today, last is first. Jerry Park was the only one to get this truck, another in the large family of vehicles which used the Ford C series cab (designed by Budd). 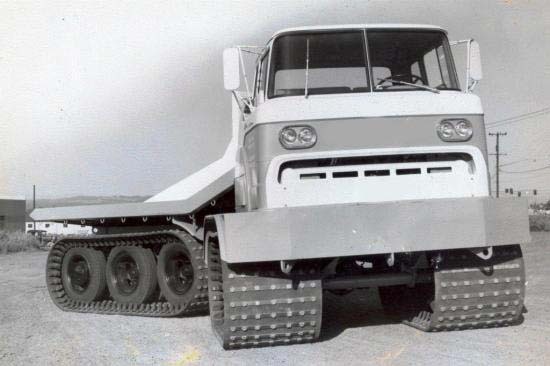 This odd articulated tracked vehicle is a Wagner 4 Track, built by the Wagner Mining Scoop Company. I cannot find much info about this company, but their ancestors are still in business at the website below. It does not appear they were ever affiliated with FWD. Thanks to Bill White for this interesting photo. FWD oqned Wagner, at least for a while. I think they tried to diversify a bit in the 60s and 70d. FWD-Wagner products were 4 wheel compators used in dirt work and land fills. I think they also made 4 whhel drive rubber tired tractors too. I also recall seeing FWD axles under a few pieces of construction equipment. One in particular was a rough terrain forklift similar to Lull. I don't recall the name. But they marketed their axles under the name Gittar. Didn't have a who;e lot of success. Their axles were a little fragile. FWDs were notororius for axle and tranfer case problems, and just try and get parts quickly. This had a lot to do with why they faded as a truck brand. Just happended to photograph this FWD Wagner at the Cooke County Tractor show at Lindsay, Texas last Saturday.It was powered by a 4-71 GMC. Don't know the year of manufacture.Didn't know at the time it would be relavent to a WAI discussion. the other company formed was for the mining industry. The Wagner mining scoop company. This is the one Jeff posted in the link below. Elmer Wagner, one of seven brothers, began experimenting with a 4WD articulating tractor designs in 1949. In 1954, the Wagner brothers, Bill, Guy, Eddie, Walt, Harold, Irvin and Elmer partnered with J. Burke Long and formed the Wagner Tractor Co. Inc. Early tractors used Waukesha engines, but by 1956 all had Cummins engines. Full time tractor production began in 1955. In 1961, Wagner was sold to the Four Wheel Drive (FWD) Corporation of Clintonville, Wisconsin, which was a manufacturer of heavy-duty off-road vehicles, and the tractors division became FWD Wagner. By the end of 1968, FWD Wagner had sold the rights to some of their models to the Raygo Corp.
Their models were so well received that John Deere bought out the production of Wagner tractors for a couple of years, beginning in 1969, until they developed their own successful 4WD tractor, as the John Deere 8010 and 8020 models were a failure. This removed Wagner as a competitor and allowed John Deere time to develop the 7010 and 7510, which introduced in 1970 and 1972 were subsequently a success. In the meantime, FWD Wagner was not allowed to sell tractors under their own brand. With Wagner's exclusive deal with John Deere, Wagner's own dealers were left without a tractor to sell. Some of these dealers began retrofitting old Wagner tractors, or began producing their own. The Rite and Big Bud tractors were both born this way. The source I used to identify the WAI is US Military Tracked Vehicles by Fred Crismon. He stated that Wagner Mining Scoop company of Portland was a division of Four Wheel Drive Auto Company of Clintonville Wisc. so thats why I assumed that. Execution: 0.187. 15 queries. Compression Enabled.